The American Kennel Club recognises eight official Shih Tzu coat colors. These are black, white, blue, liver, gold, silver, red and brindle. Within these colors, there can be a wide range of combinations and markings, making each Shih Tzu coat beautifully unique. In this article, we'll look at the black coat color, including the particularly rare, but extremely striking, solid black. 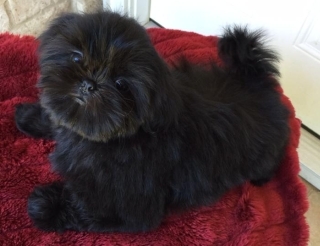 Many Shih Tzu color combinations can have some black in the coat; since a Shih Tzu puppy's coat color can be similar to its sire or dam's color, a mix of both parents' colors or tricolour, it's relatively common to see combinations such as black and white or gold-toned colors with black around the head or tail. Black markings are also frequently seen on Shih Tzus with various coat colors, with black 'masks' around the muzzle, and sometimes extending upwards to the eyes, ears and forehead, being especially common. 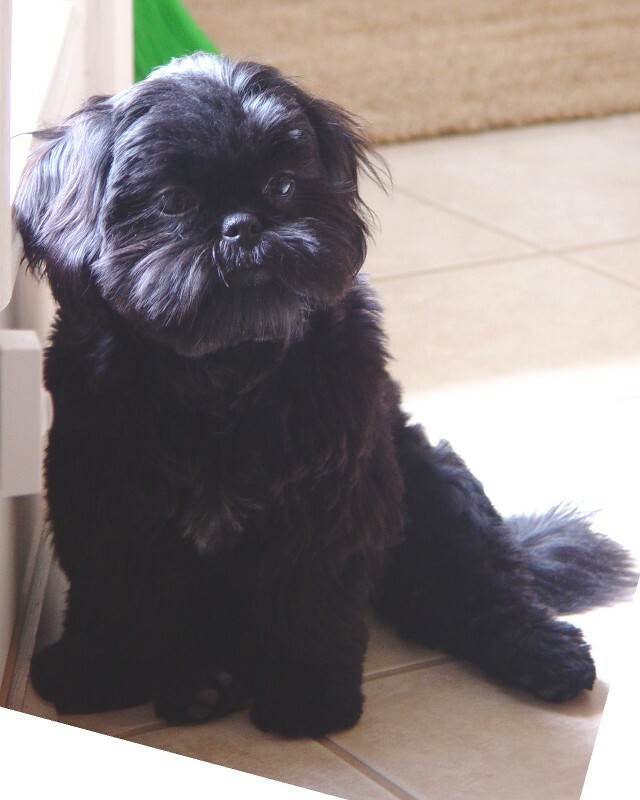 While black is a dominant coat color, a solid black Shih Tzu is genetically very unusual indeed. 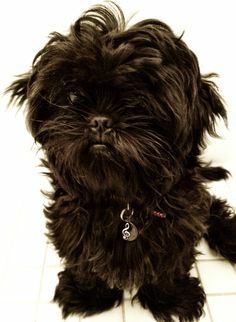 To be considered solid black for the purposes of AKC registration, a black Shih Tzu must have no other coat color at all – if there's even a small amount of another color, the coat color will be considered a combination and the dog will be registered as such. 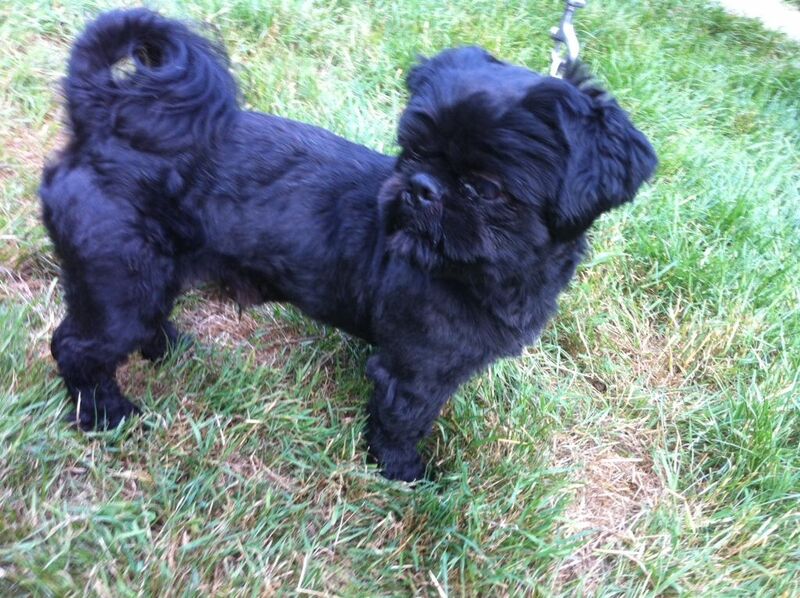 It should be noted that a solid black Shih Tzu will also always have a black nose, eye rims, and paw pads. All Shih Tzus look beautiful when groomed, but most Shih Tzu fans would agree that the glossy shine of a solid black Shih Tzu is especially striking. However, potential owners should be aware that coat colors can change. 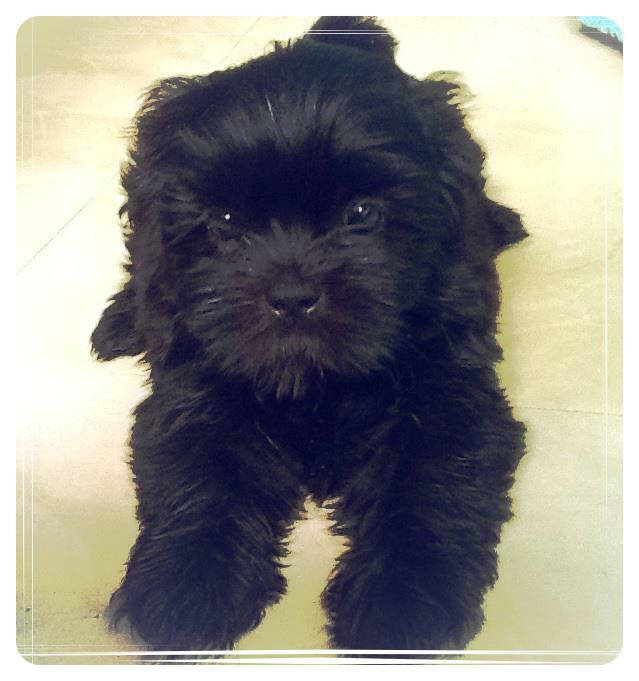 Black Shih Tzu puppies may lighten as they grow up and the coat can develop into silver. Sunlight can also affect black coloring, causing the coat to develop reddish tones (although this can usually be corrected by using an appropriate coat color enhancing shampoo and ensuring that the coat is kept properly conditioned). These issues aside, the black colored coat can look wonderful, as the below pictures show!